You don’t see a lot of breakfast on my blog. It isn’t that I don’t eat breakfast. It is just so hard to cook breakfast for one. Well not hard, but it just isn’t worth it. And I like oatmeal. A lot. Even weekends when the Omnivore is here visiting me (no, our house in another state still hasn’t sold so yes, we’re approaching 6 months of living apart), I rarely cook a big breakfast for the both of us. Why? I wake up first and am rip roarin’ ready to eat. In fact, I think it is my stomach growling that actually wakes me up most of the time. The Omnivore wakes up later and has to wait before he eats. (Yeah, say that last part in a whiney voice). But I’ve found if I wake up and just get crankin’ in the kitchen, he’ll eat anyway. And this recipe I picked seemed like the perfect amount for two people anyway. Maybe two people and a toddler. Definitely not three people. I didn’t tell the Omnivore about the ricotta in these pancakes because (insert whiney voice again) he doesn’t like ricotta. He would have never guessed it anyway. He had two servings of these pancakes. These fluffy, just a little orangey, pancakes. Even though he can’t eat that early and doesn’t like ricotta. This recipe is a keeper! Combine egg yolks, orange rind, juice, cheese, flour, milk, butter and salt in large bowl. Stir thoroughly. Beat whites with electric mixer until soft peaks form. Fold egg whites into batter. 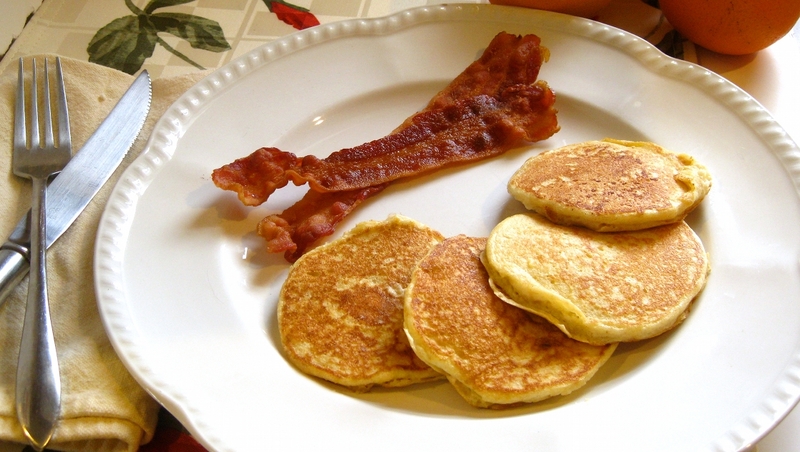 Drop batter by heaping tablespoons onto greased, preheated griddle or skillet. Cook pancakes 2 minutes each side or until golden brown. Serve hot with honey or syrup, if desired. I have a husband who says “I’m not really hungry right now” until he smells food…. then he’s all about it. I love that you hid the ricotta content from your husband….! 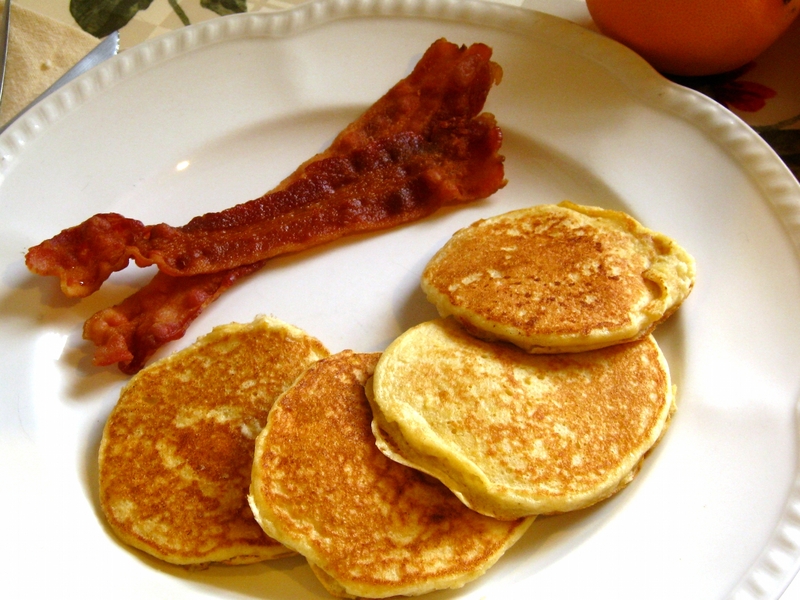 I’ve heard that adding ricotta into pancakes adds great fluff and texture. I haven’t tried it – but this recipe looks great. I bet the orange adds the perfect freshness! The Omnivore certainly is whiney in the mornings. Aw, I miss the good ol’ days when you guys lived together and we got to hear more about you sneaking supposedly-disliked ingredients into his food. I get up several hours before Dave on weekends too, but I always have some sort of unhealthy treat around to snack on while I wait for him to wake up. Or sometimes I eat almonds. But not usually. Usually I eat cookies.